During the flowering stage, your marijuana is focusing completely on making buds. While they’re making buds, plants often need a little extra TLC as they are not putting as much effort into keeping themselves healthy. Unfortunately, this happens to be the exact time that most beginning indoor growers tend to get comfortable and start forgetting about their plants. As an indoor marijuana gardener, your actions during the flowering stage have a huge impact on your yields and the final potency of your buds! What makes a plant start flowering? How do you get cannabis to make big buds during the flowering stage? Here are 7 simple yet effective things to pay attention to so your Flowering Stage goes great and your plants produce a huge, picture-perfect harvest every time! Keep an eye out for unexpected male plants or hermies (hermaphrodites; girls that grow “male” parts). 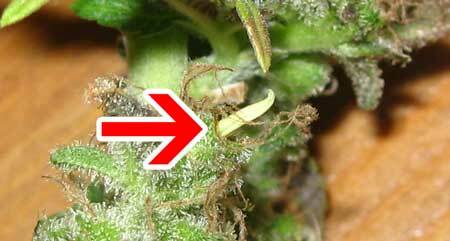 Basically look for balls/pollen sacs or little yellow bananas growing among all your beautiful buds and white hairs. Definitely remove them on sight to prevent uncontrolled pollination, and consider removing the whole plant if possible to prevent seedy buds! In botanical terms, a banana is a “stamen”. These produce pollen and are normally found inside a pollen sac. A hermie is a female plant growing male parts, and you can get anything from fully formed pollen sacks down to a single stamen like the one below. 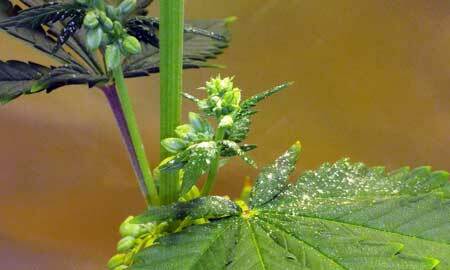 Even a single pollen sac or banana can ruin your whole crop by spreading pollen and “seeding” all the females. All pollinated female buds may stop fattening up and instead focus on making seeds. 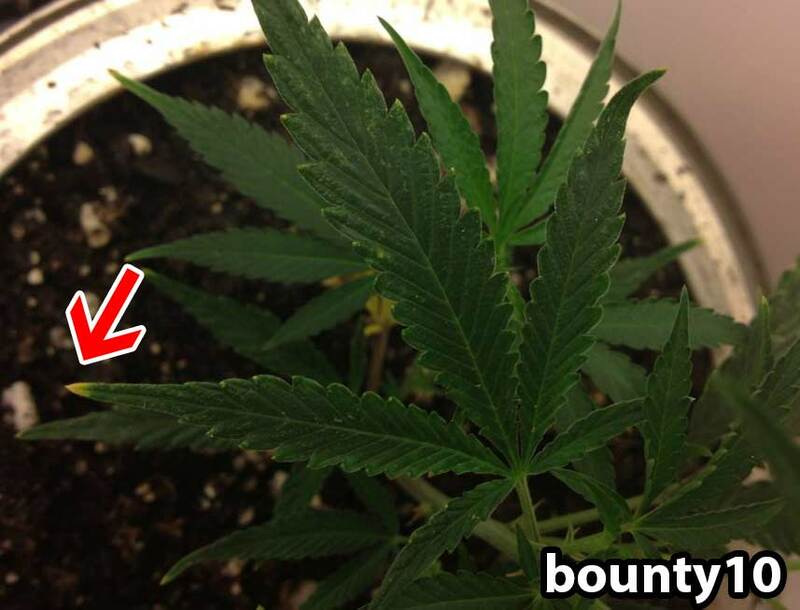 As a result, you get seedy buds and low yields. 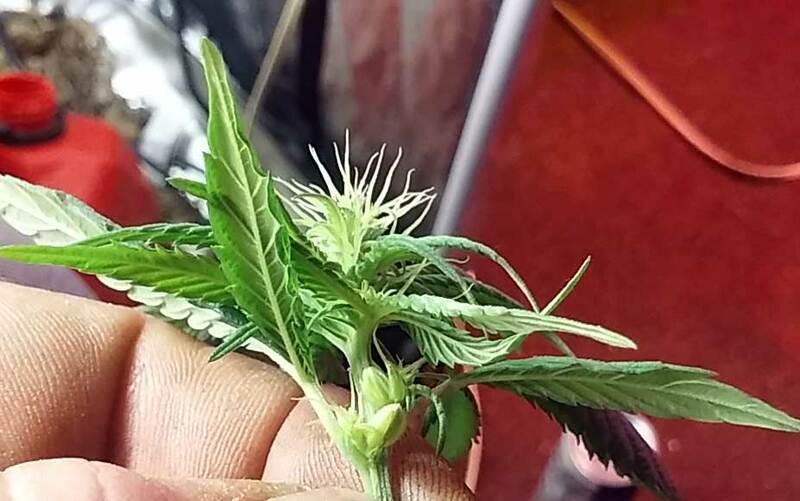 Some growers purposely induce plants to turn into hermaphrodites as part of the process of producing feminized seeds (seeds which grow only female plants). 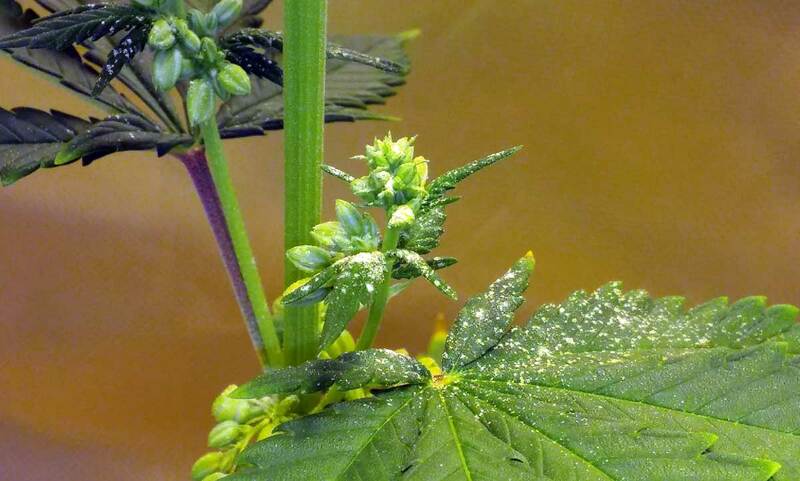 Pollen gathered from a hermaphrodite female plant produces all-female (feminized) seeds when used to pollinate buds, though if you do it the wrong way your seeds are more likely to be hermaphrodites themselves. 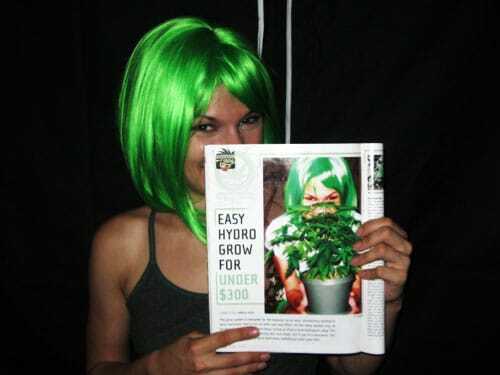 Learn more about feminized seeds. During the first month of the flowering stage, many cannabis plants go through a dramatic upward growth known as “the stretch“. However, for some strains, the plants may continue to grow taller for much of its flowering period, even after the initial flowering stretch. Example of the flowering stretch in action – your plant may double in size after the switch to 12/12! Some strains stretch more than others, but breeders should be able to tell you what to expect so you can plan for it. This is why it can be helpful to know what strain you’re growing! Indoors, it’s common for plants to be inching closer and closer towards grow lights without the grower realizing it. Always keep a barrier of space between your plants and your lights, and make sure you switch your plants to the flowering stage before they’re half the final desired size! 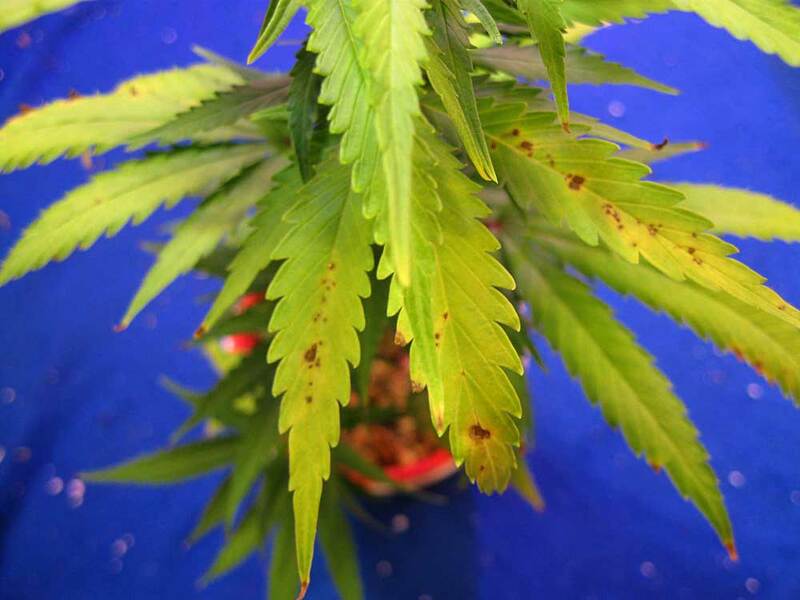 More than half of the marijuana plant problems submitted to GrowWeedEasy.com end up being the result of too high or too low pH in the root zone. In hydroponics, pH management is absolutely crucial to your success. Even when growing in soil, pH has a big effect. Some growers get may lucky, but if you’re having unexplainable problems, I highly recommend at least checking the pH and eliminating that as a possible cause. PH problems can cause wrinkly leaves, curling, and what appears to be a wide variety of nutrient deficiencies. Plants can’t absorb nutrients when the pH is off at the roots, so symptoms can look like almost anything! Spots on leaves are another common symptom for pH problems! 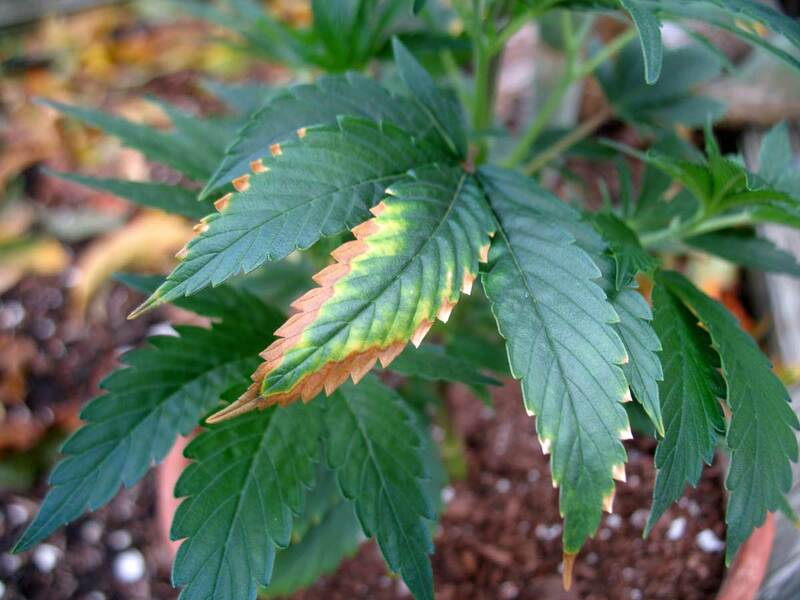 Many growers see burnt edges or tips and instantly think nutrient burn, but it could actually be a deficiency caused by pH imbalance. If more than just the tips are burnt it’s likely a sign of pH problems. Optimum pH varies a bit from strain to strain, and between different growing mediums, but a good rule of thumb is maintain a rootzone pH of 5.5-6.5 in hydroponics, and 6.0-7.0 when growing marijuana in soil. If you’ve been monitoring pH from the beginning, continue to monitor pH. Don’t get too comfortable and get lax when you’re in the most important phase of your plants life! If you haven’t been monitoring pH and suddenly get a bunch of unexpected problems, check this before you take any other drastic measures! A pH kit is cheap, and easy to use! Learn how! When I first got a pH kit, I was amazed at how much stronger and resistant to problems my plants were once they started getting the optimum pH at their roots. This allows plants to easily absorb all the nutrients they need, so they can focus on making buds. 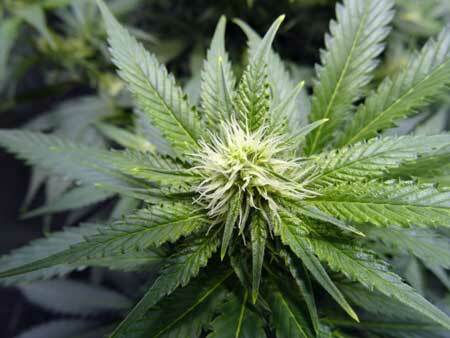 As a result, you may need lower nutrient levels overall, which often results in smoother, tastier buds. Going overboard on nutrients (even organic nutrients if they’re highly concentrated enough) can ruin your yields and makes buds smell or taste bad! This is terrible to do late in the flowering stage! Never raise nutrient levels unless you’ve ruled out a pH problem and then do so slowly. 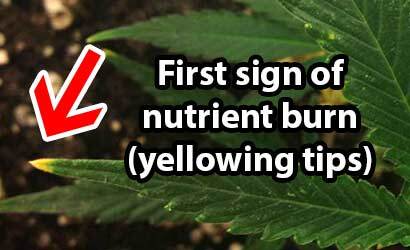 It’s normal for your oldest, lower leaves to start yellowing and falling as harvest approaches, this doesn’t mean add more nutrients. 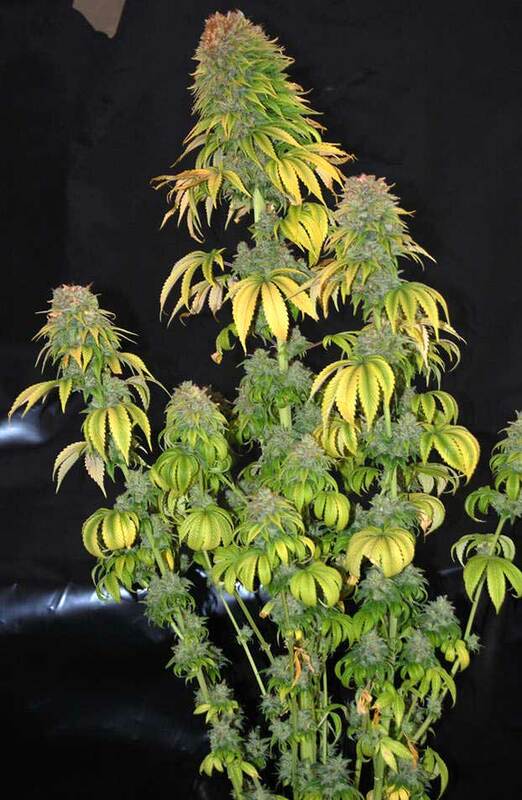 Plants need less and less nutrients as they approach harvest and it’s natural for leaves to start yellowing, especially older leaves towards the bottom of the plant. The secret to staying stealthy when growing cannabis is “Don’t tell, don’t sell, don’t smell.” Basically don’t tell anyone, and don’t let anyone see or smell your garden. Some cannabis plants are a little stinky in the vegetative stage, but most plants produce a very strong smell in the flowering stage. 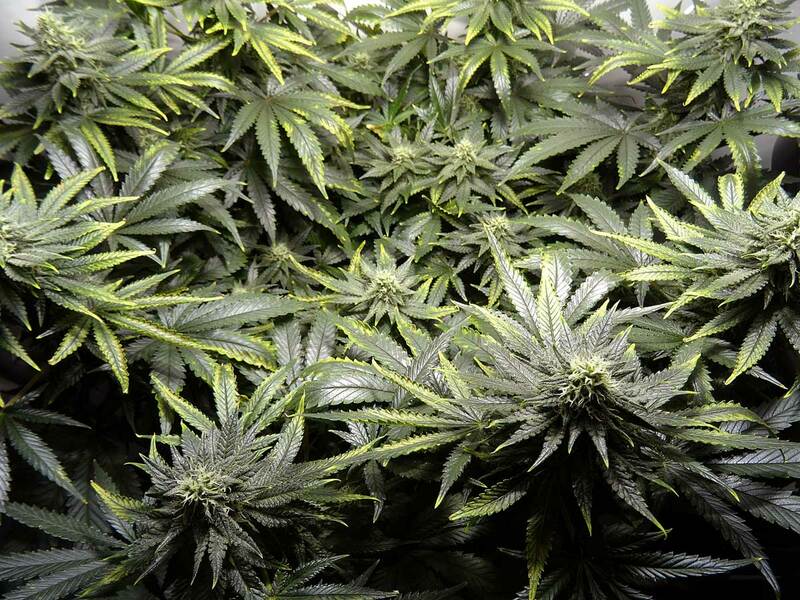 It’s important to take the time to get supplies to prevent odors from escaping the grow space! In the flowering stage, humidity should be kept below 50% to prevent mold. When humidity gets too high in a grow room, the plant pulls excess water in through the leaves which increases your chances for mold, especially in fat buds. Sometimes you may think your buds are totally fine, only to find a gross moldy mess in the middle, like the bud pictured to the left. Some growers will dramatically drop the humidity of the grow room during the last few weeks of flowering using a dehumidifier. 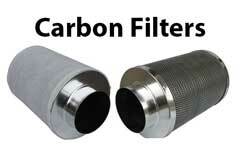 This actually stresses your plant in just the right way, and may increase resin production. I recommend flushing plants with plain, pH’ed water for some time before harvest to leach out any extra nutrients. In soil, it’s common to flush for about 2 weeks. In coco it’s good to flush for about 1 week, and in hydro you only need to flush plants for a few days. A plain-water flush may improve the overall taste and smell of your buds, especially if you’ve gone a bit overboard with nutrients. Hint: A secret grower tip is to add a bit of regular blackstrap molasses (a teaspoon or two per gallon) to your water during the last week or two of flowering as a cheap yet effective alternative to those expensive supplements that improve bud flavor. This works for soil and coco coir, but not hydroponic setups. How long does the Flowering Stage last? When do I harvest? The time spent in flowering depends heavily on your strain, as well as the effects you’d like to produce. 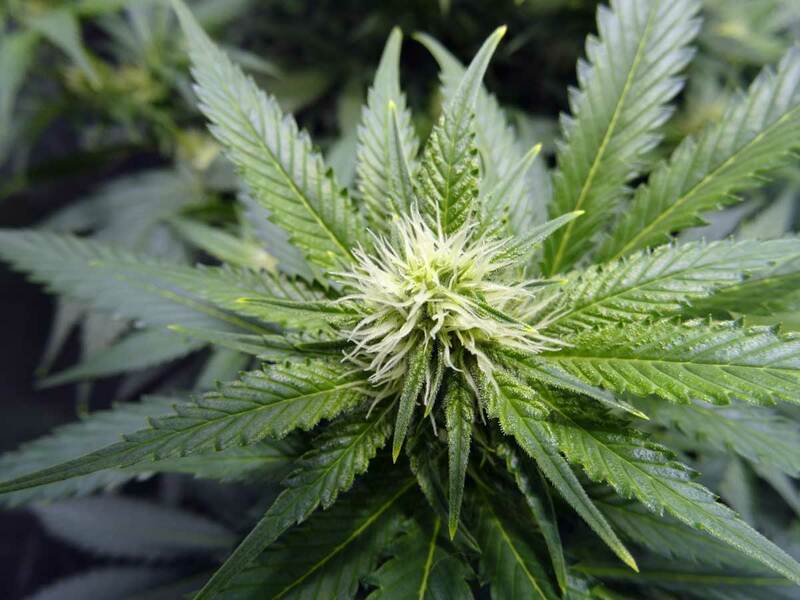 View a complete marijuana timeline. 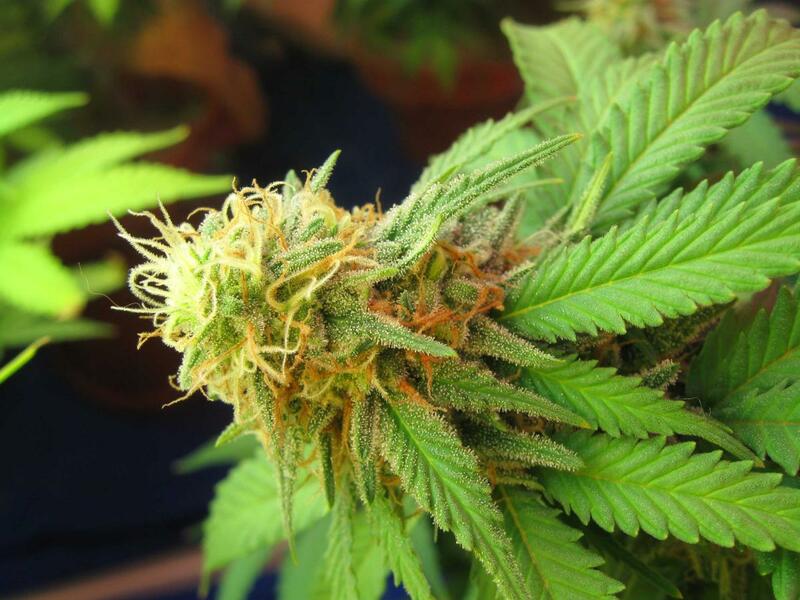 Most strains need 2-3 months in the flowering stage before they’re ready to harvest, though some strains are a bit faster and some strains, such as some sativa and hazes, can need as long as 4 months of flowering before they’re ready (though there are tricks to get them to mature faster). Some growers prefer to harvest on the earlier side for more of a “buzzy” high while other growers harvest later for more of a “couchlock” high. When you harvest at the right time, you get the best yields. Plus you get the effects you want! 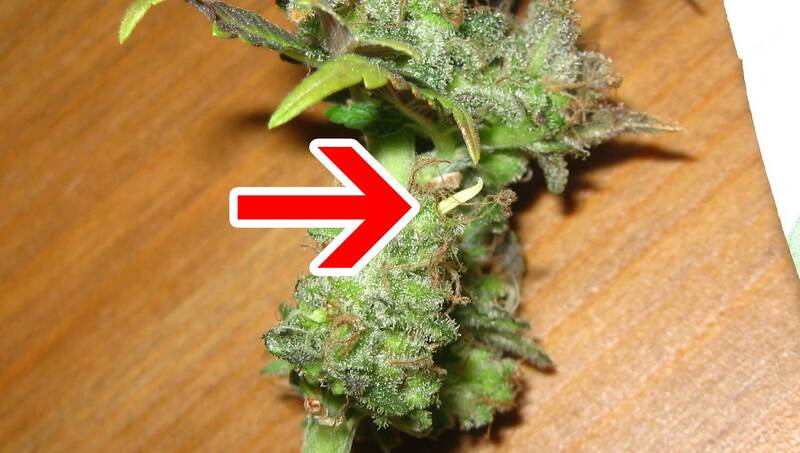 Use a jewelers loupe, handheld microscope, or (my personal favorite) a USB microscope to look at your buds. You know you’re ready for harvest when most of the clear, glassy trichomes (little mushroom looking growths) have turned milky white colored (looks like plastic to me), with a few amber/yellow trichomes. When they’re ready, they’ll also start to lean over from the weight of the bulbs on top. Once the plants are cut down, you can trim the leaves off of them and hang them up to dry. Although it may seem like everything is over, the next few days are actually incredibly important to your bud quality. Avoiding common problems in this phase will yield you big dividends! DID YOU KNOW? 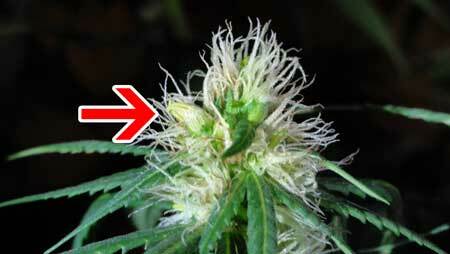 You can cut all the buds off a plant and put it back under 24/0 light to get her to revert back to the vegetative stage. One reason you might do this is if the plant has been a huge producer and you want to take clones. After a month or two, the plant will have fully recovered and started growing vegetatively. At this point, clones can be taken. You can even put a re-vegetative (commonly called ‘re-vegged’) plant back into the flowering stage and harvest again though this is usually inefficient compared to just starting a new plant from seed. It is possible to take clones during the flowering stage, but these clones are tougher to get to take root, and for some reason clones taken from flowering plants tend to display odd growth at first. Some growers take clones from the flowering stage on purpose, with a technique known as “monster cropping“, to take advantage of this odd growth to produce bushy monsters. There are many ways to dry your buds, such as hanging them from a string, leaving them spread out on netting, or even just laying them out on cardboard. 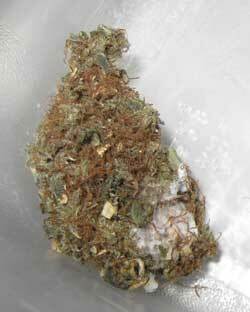 Once your buds are dry, leave them in an airtight jar, and place the jar in a dark place. You can open the jar every so often and jostle the buds a bit; this is also a good time to make sure you don’t see/smell mold and buds still feel dry. It’s a good idea to do this more often at first (once a day in the beginning) and slowly do it less (once every 3-5 days). After about 2-3 weeks of this process, you’ll have great herb! Cure even longer, up to 6 months, for continued improvement in flavor/smell. I hope you enjoyed this article, I wish I had known this stuff when I first started growing! I believe adults should have safe access to marijuana, and I’m dedicated to showing you how easy it can be to grow your own at home! Please check out the other articles on GrowWeedEasy.com!